We knew Nokia plans to name each Symbian iteration from now on with a woman's name alphabetically - Anna, Belle, and so on, but nothing was said about the handsets receiving girly names themselves. Nokia's upcoming Symbian lineup includes four devices, leaked as the Nokia Helen, the Nokia Cindy, the Nokia Zeta and the Nokia Fate, but they might end up named with the more conventional Nokia model numbers upon release, according to what's supposed to be a leaked roadmap. All four handsets are expected in the third quarter of the year with 1GHz processors and screens with a resolution of 360 x 640 pixels, tech blogger Eldar Murtazin added. 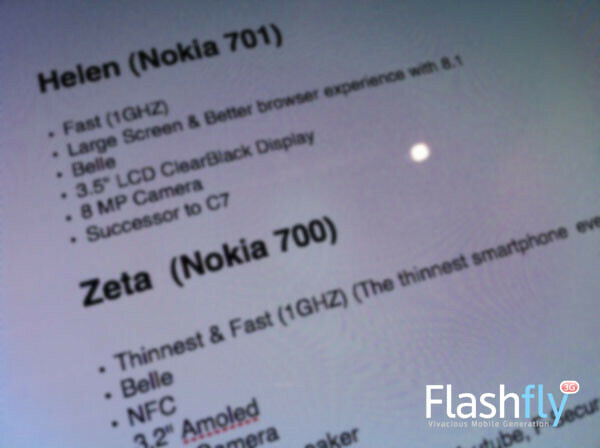 The blogger mentioned that Nokia is most likely to release the handsets in September. The roadmap shows a Nokia Helen, with 3.5" ClearBlack display, this time of the LCD variety, running Symbian Belle, which is pinpointed a successor to the C7, with 8MP fixed-focus camera. Combine this with the expected September released date, and we might have the Belle update around that time of the year on more devices. Another interesting proposition is listed as the Nokia Zeta, which would carry a 3.2" AMOLED display, and, as far as we can understand from the chopped sentence, is aiming to be "the thinnest smartphone ever", again running Symbian Belle, and having an NFC chip inside. 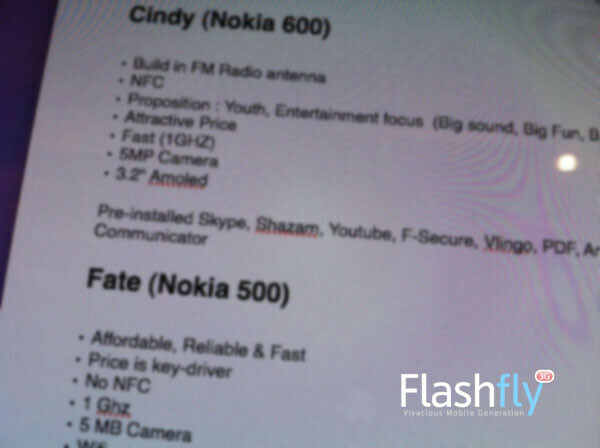 On another sheet are listed two more handsets - the Nokia Fate and Nokia Cindy, with the key words for those being "affordable" and "attractive price". Both are listed with a 3.2" AMOLED displays plus 5MP cameras, but the Nokia Cindy has NFC, whereas the Nokia Fate doesn't, which might be the chief difference between these two. What's most interesting about these eventual Symbian devices is that all chipsets are listed as 1GHz, so we might be finally getting rid of the sub-700MHz silicon that is powering the current flagships, as was promised by Nokia. Whether these will be dual-core or not, is not specified, but if they were, the list would surely have mentioned it in the description - you know, for bragging rights. If the whole thing is real, we should know more in the upcoming months. After all, Nokia promised 10 more Symbian devices in the next 12 months or so. Full of grammatical blunders (Amoled instead of AMOLED, Ghz and GHZ instead of GHz, and the funniest one, 5 MB camera!! XD). Doesn't sound something that's leaked out of ooficial stuff. finally nokia build it and they will come!!!!! Nokia build it... and lose money... blah! No new qwerty phones by nokia ?